Are you looking to find Spanish eBooks for children? We recently discovered an amazing source of ebooks in Spanish, English and even French! First, I have to be honest with you. I don’t have a natural bent towards eBooks. In fact, our schoolroom is lined with shelves of thematic book boxes filled with classic, solid children’s literature. I love to pile children around me for a “book party,” where we snuggle together and take turns choosing stories from a book box until I lose my voice. hehe There’s something magical about turning the pages, talking about the pictures, and seeing my children of all ages engrossed in the story line. I love books! However, finding books in Spanish has not been so easy. One of our first stops upon arrival in California every summer is our local library. Everyone gets to choose one book, then I max out the rest of our 6 person limit with books in Spanish. We take them home, test them out, and I add the favorites to an Amazon wish list to buy over the summer and take back home to Colombia. This summer was different. We arrived to California full of fevers, and not able to leave home for over a week. This meant no Spanish library books, and a house full of sick, bored children. Fortunately, we made an discovery of epic proportions! Puns aside, I have been SO grateful to discover that Epic! has more than 25,000 beautiful books for children 12 and under. If you are looking for Spanish ebooks for children, Epic! has more than 500 Spanish and Bilingual Books. Woohoooo! You can access the platform in 4 ways. Once you load the app on one of these four devices, just sign in, and start reading! They have a great “Read to Me” option on many titles, so children can hear the book being read to them while the watch the words being highlighted. This is a great option for developing Concepts of Print, and learning how to track words. I’m looking forward to taking full of advantage while we are on our many road trips scheduled for this summer. I don’t allow library books to leave the house, but eBooks are a different story. Each profile can select up to 25 books to be available offline, which means they can be read and browsed through without an internet connection. This is a great way to pass the time in the car, and gives an educational option and a chance to keep reading even if we are far from home. Now is the perfect time to sign up with Epic! 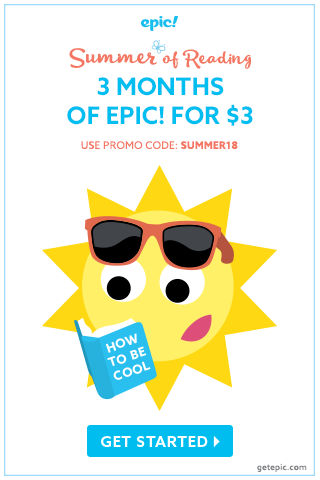 as they have great summer reading special. 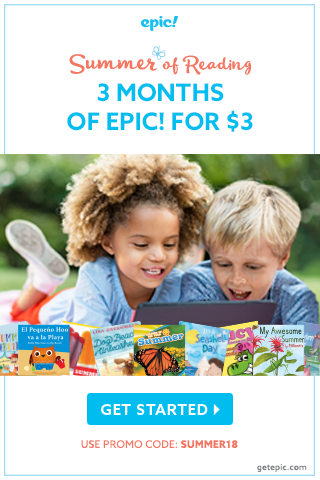 Sign up for 3 months of Epic! for just $3 until June 12. What are some of your favorite titles in Spanish, for your youngest kids, that are available on Epic?